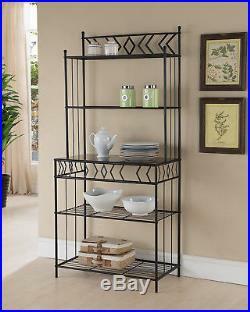 Black Metal 5 Tier Kitchen Bakers Rack Stand With Shelves & Storage Black Metal 5 Tier Kitchen Bakers Rack Stand With Shelves & Storage Key Features. Finish: Black; Marble Top. Materials: Metal; Marble Veneer. Dimensions: 30″W x 16″D x 67H. The size of the two upper shelves are 29″W x 10″D x 11H. The size of the wooden shelf is 28.5″W x 14.5″D. The space between the wooden shelf and the two upper shelves is 15H. The size of the upper bottom shelf is 29″W x 16″D x 14H. 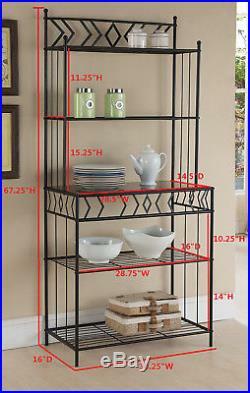 The size of the bottom shelf is 29″W x 16″D x 10H. 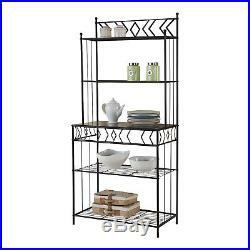 Black Metal 5 Tier Kitchen Bakers Rack Stand With Shelves & Storage. The item “PILA-HAKR022-Black Metal 5 Tier Kitchen Bakers Rack Stand With Shelves & Storag” is in sale since Friday, September 22, 2017. This item is in the category “Home & Garden\Kitchen, Dining & Bar\Kitchen Storage & Organization\Baker’s Racks”. The seller is “virventures_us” and is located in Richmond, Texas. This item can be shipped to United States.